If this listing is booked, please contact us as we work with other property owners and may be able to accommodate your stay. Our partners have properties with similar sleeping capacities, amenities and location. 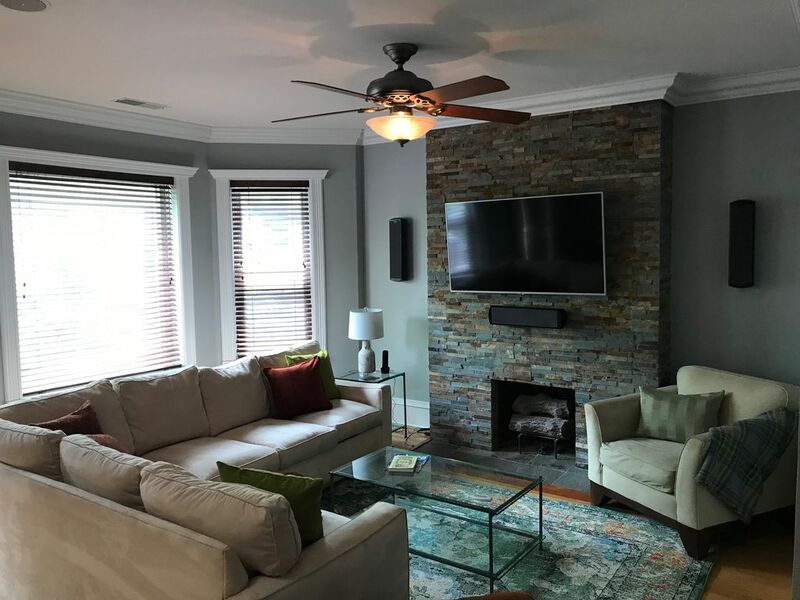 Enjoy this newly completed high-end renovation of a classic Brownstone home with 5 spacious bedrooms, 3 full baths, two full Living Rooms with full theater surround systems and formal dining room. This beautiful home is located on a safe, quiet, tree lined street on the Northside of Chicago. Lincoln Square restaurants, bars and shops are just blocks from your doorstep. This home features: Hardwood Floors, Custom Blinds, Trim and details throughout, 3 flat screen plasma/LCD televisions (55" HD in both living rooms), High-speed wireless Internet, DirecTV© with HD and complete entertainment pack of channels (HBO, Showtime, Starz, etc. ), Fully Equipped Gourmet Kitchen with Granite Countertops, Custom Cabinetry & top of the line Stainless Steel Appliances and temperature controlled wine fridge. Spacious master bedroom suite offers queen sized bed, 42” mounted LCD, walk in closet, adjoining luxury marble bath with steam shower, body sprays & large Jacuzzi tub, custom tile, his & hers vanities. The home sits on a quiet tree lined street just blocks from trendy Lincoln Square with great eateries and bars. Down Lincoln Avenue, you can find a craft breweries but, when you're done for the day, escape to a quiet oasis with all the amenities. This home will knock your socks off! Luxury marble bath with steam shower, body sprays & large Jacuzzi tub, custom tile, his & hers vanities. Great location, great property and great value. We stayed here for a family Christmas vacation. The property easily accommodated seven adults and two toddlers, and the second floor living room made it easy for grandparents to watch cartoons with the grandchildren while the young adults enjoyed having the ample first floor to themselves. The kitchen and two separate dining areas were perfect for fixing meals and feeding a hungry crew. The location is ideal for getting around Chicago, only two blocks from the Rockwell station on the Brown Line. Between the “L” and Uber, we barely used our cars. The one negative, and its a small one, is a lack of cooking gear in the kitchen. Could have used a cutting board and some more utensils, but we managed fine. The showers are the bomb - great water pressure and endless hot water. On the first day, the cable internet and tv did not work. Daniel, the owner, managed to get Comcast out the next day (some idiot had cut the cable in the alley) and DirecTV on a Saturday and we were back in business. Very attentive owner. If you’re looking for a capacious, well located brownstone within walking distance of all of Lincoln Square, you’ve found it! Talman house has a great location. An easy walk around the corner to the Brown line, restaurants and grocery store within easy walking distance while still being on a quite residential block. The lay out of the house is perfect for a group of 9 people. The down side is the property is poorly managed, door knobs were missing, closets with no shelves or cloth rods. Some towels and linens were stained and thread bear, we did not have an adequate supply of toilet paper, and there were towel still in the the washing machine when we arrived. The kitchen cabinets were disorganized and needed cleaned. The manager was hard to communicate with, not returning emails. He stopped by one day but did not stay to hear our concerns. Actually telling us that he had forgotten we were arriving. Again we enjoyed the property and it's amenities but be advised of what you are getting into. hi, we did have a nice stay in Chicago as the town is super cute; great places to eat; great location to the train and 25-30 minute ride into the center of town . I would recommend that the owner put some more time into some maintenance of the home (which has some small things that could be fixed quickly); and buy some new linens, towels and pillows (which are old and ragged). I would also recommend getting rid of the "wash your own towels" before leaving as we found this really stressful with a morning departure. Saved the Day and Weekend for our Group! Our other location cancelled on us last minute. The owners were responsive and turned a bad situation into a great one. The home was awesome and our weekend unaffected by the sudden change in plans. We were able to focus on having fun and enjoying Chicago and the convention we were attending. Would definitely stay here again and everyone had tons of room to relax and unwind at the end of the day! It seems the overall theme of reviews for this home was correct. It's a great home with impressive amenities, all of which were very nice BUT, the main thing was it was well-kept and provided easy access to the city. We experienced no issues with the home and were free to enjoy the city. We expect to come back in the summer and this home will be on our list because it is an easy trip to Wrigley from here although we spent most of our time going downtown on the El. Great place and the owners were very attentive to our needs. When we noticed toilet paper was low and made a call, there was a knock at the back door in less than an hour and we were resupplied, it's the little things! We will be back. I loved the location and space in this home but I was extremely disappointed in the difficulties we had while staying there. First off, to get the channel to change on the TV, you had to get up and go to the closet in which the cable box was located - not sure why it wasn't with the TV but it was very frustrating. The owner says this is getting updated but was annoying during our stay. Same deal with both main TVs. The remote for the upstairs bedroom didn't have batteries so we either had to buy them or go without. We went without. The beds, pillows, and bedding all had stains which were kind of gross. The bedding was clean but you could see that they were not taken care of. Costco has sheet sets for $40 and pillows for about $20 so this would have been a cheap investment to make the place look nicer. Also, you have to launder all of the towels prior to leaving. This is a huge inconvenience - There were 10 of us in the house and I spent all morning of our last day there washing towels because everyone needed to shower before leaving. I have never stayed in a place where this was required. My biggest complaint, however, was that the oven didn't work. We specifically rented this home for the nice, up to date kitchen because we were having Thanksgiving dinner at the house and were hoping to cook some meals ourselves while in Chicago. We ordered a ton of food and ended up having to cook everything in the microwave. The owner offered to move us to a different house on Thanksgiving but that would have been even more of an inconvenience since we were leaving 2 days after that and would have to pack up all the food for the move. I mentioned to the owner prior to our stay that we would be cooking Thanksgiving dinner at the house and were really excited about the kitchen so this should have been checked prior to our arrival. Nothing was done to compensate us for this HUGE inconvenience. I was in tears - our Thanksgiving dinner that we spent so much money on was more or less ruined. I really had hoped that I could give this place 5 stars but honestly, I cannot do so until some updates are made because others should not have to deal with this when you are paying this much to stay at a vacation rental. I am a landlord myself and I would not have rented out this place without ensuring that everything was working and clean. Unfortunately, it is simply not possible to please everyone all of the time. Unfortunately, some people think it's ok to misrepresent their experiences in order to satisfy their own sense of self. The other reviews speak clearly to the quality of the home. In this instance, a stove went out upon arrival and the guests were IMMEDIATELY offered upgraded accommodations. They passed. If a guest is unwilling to accept an alternative when a mechanical failure occurs, there aren't many other options. • 2 miles from Lake Michigan. • 11 miles from McCormick Place.